Wow - I don't even know where to start with this post. I remember the time when I first started googling nail polish swatches, my stash contained about 30 bottles and I was just starting to become a little more obsessed with nail polish. It was nearly three years ago. Back then there weren't nearly as many nail blogs around, but I specifically remember that the first two I came across were Scrangie and The Polish Addict (which sadly stopped being updated shortly after I discovered it). I soon discovered that in 2009 RBL created a line of three polishes designed and named by bloggers. Scrangie, The Polish Addict and All Lacquered Up created those polishes. I thought to myself back then how amazingly awesome that was - kind of like the holy grail for a nail blogger. I can't tell you how hard it was to pick a colour to create. When someone asks you if you could create the most amazing shade in the whole world, what would it be, your mind really goes wild. But then, when you realize that this is actually going to become a reality, it's really hard to narrow your ideas down to just one. I initially thought of some sort of gold polish but soon realized from looking at my collection, pretty much everything had already been done in gold. In the end I chose green, because I know there are a lot of green lovers out there, and it's not your typical popular colour that regular consumers would go for. It's more edgy and definitely more of a shade that nail polish addicts go for. I wanted to create something unique and I think that's exactly what the girls at Picture Polish and I have done with this polish. 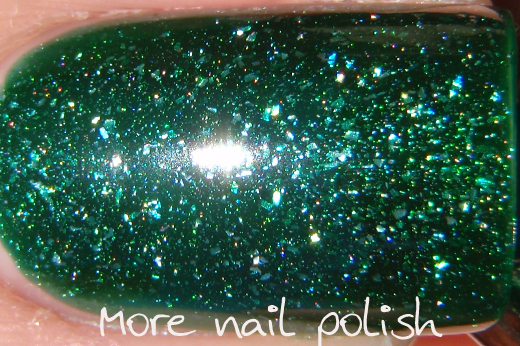 Kryptonite is a dark green jelly with a stunning large particle holographic effect. The polish is created using the exact same particles that are in the Ozotic 600 series polishes and as any Ozotic fan would know, there is no dark green shade in that collection. This is two perfect coats topped with Seche Vite. The jelly finish is smooth and there are no streaks at all in the jelly finish. At two coats the jelly finish is see through enough to see all the sparkling holo bits shining through and giving the polish lots of depth and sparkle. I've worn this multiple times already and found the wear to be excellent - the exact same quality I've come to expect from all my Picture Polish shades. You can really see the various irregular shaped holo pieces in this macro shot, they range in size from really tiny ones to some that are quite noticeable and reflect lots of rainbow light. 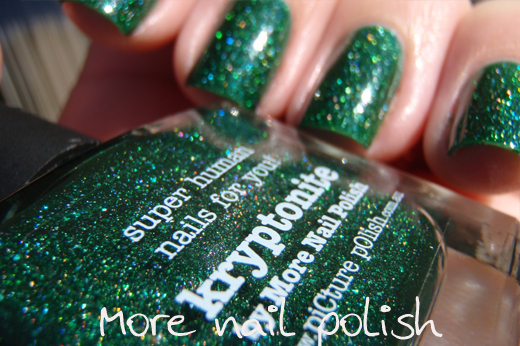 Just like the Ozotic 600's, Kryptonite is completely smooth on the nail, because it's not glitter, it's micro thin holo particles. In the shade you can see that the polish is most definitely green, not one of those polishes that is so dark green it almost looks black. After I decided on what colour and finish polish I hoped for, I had to come up with a name. All the usual emerald type names came up first, but then I had a flash of brilliance and thought of Kryptonite. I think it matches the polish perfectly. 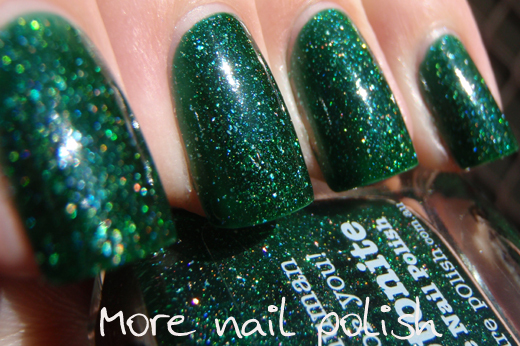 The other thing that Picture Polish have introduced is some white print on labels for darker polishes. They used to all be black, and on dark shades it was really hard to see the writing. I love the new labels with the print in white. 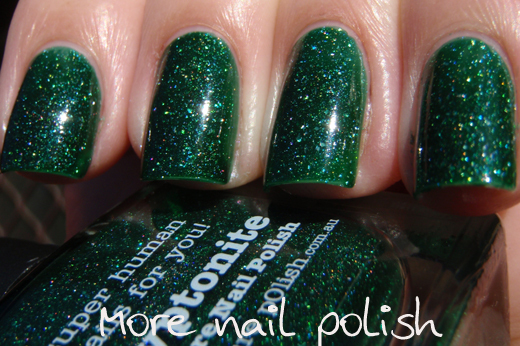 Oh, and you know how all Picture Polish shades have a little catch phrase on the bottle, the Picture Polish girls came up with this one for kryptonite, and it is "super human nails for you!" I love it! Thank you so much to the girls at Picture Polish. I think the Collaboration Collection is a fantastic and incredibly generous idea and I hope these polishes are a huge success for you. Now we just need to stay tuned to see some more polishes from the Collaboration Collection. I can't wait. 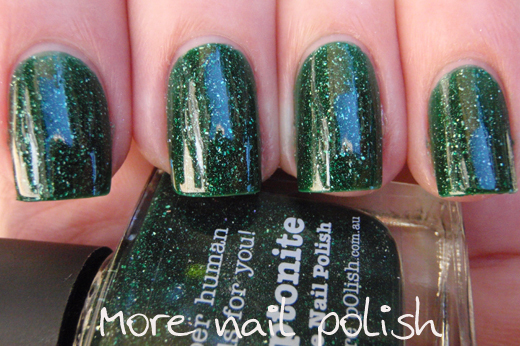 Kryptonite will go on sale at Picture Polish on Monday 30 July and it will cost $11.50. It will also be available through all the Network members online shops too. I know I'm going to be buying umpteen bottles of this, because they will be the perfect swap and giveaway item from me! YAY. So, what do you think? I'd love to hear your feedback about my shade. Wow, that's a fantastic shade and looks very unique! I'm so excited for you, I was checking my Reader throughout the day wondering what your announcement would be! Congratulations! How completely stunning! I must say, I am surprised you did not choose gold, but your decision was logical :). I LOVE Kryptonite! Kiddos on the name as well!! Totally stunning and unique!! Congratulations! Well deserved for all you do here and Congratulations to Picture Polish for recognizing your talents. Great polish! And so awesome that you were asked to create it! This is simply stunning!!! Thank *you* and the pp girls for such an awesome color! Cathy this is so incredibly exciting!! I don't know what I'd do if I had a polish named after me! So happy for you! I can't wait to see the others in the collection. Congrats! Congrats! This is such a beautiful green. OMG! I love this so much! It's such an interesting colour! Congrates! Yes! A green and a holo! Thank you! Thank you! It's gorgeous and it will be mine. This is so awesome for you. Congratulations! gorgeous shade, I love it. Congratulations Cathy! Aaaaaahhhh! Congratulations!! AND THANK YOU SO MUCH FOR PICKING THIS COLOUR! My collection of green polishes has exploded since a year ago due to my hunt for THE green polish. I'll definitely have to add this one to my collection! Oh my this is amazing!!! All, the polish and most of all, that it is YOUR nail polish!!! I'm such a Superman dork that it's actually the name that caught my eye first, and I got all excited when I read the rest!! I live that it's not glitter, seems like everything nowadays comes with glitter... I will definitely be buying this!! CONGRATS!!! Congrats on creating an amazingly beautiful polish! Can't wait to try! Um, yeah. That is amazing. Well, what can I add to all the other comments, I just have to agree with all of them.... Well done!! I'll be waiting for it at my supplier in the Netherlands. That is gorgeous! Great job on that colour and congrats on having your own polish! SO exciting! :) You totally deserve it!! I'm so thrilled for you. I will definitely be adding a bottle to my stash...it is lovely and you are lovely as well. OMG Cathy, this is amazing!!! How freakin' awesome for you!! And the polish is soooo gorgeous! I can't wait to get my hands on it! Way to go!!! Congrats babe! Excelent choice! it's sooooooooooo beautifull! Gorgeous! Unlike any polish I've seen before! Congratulations!!! and how exciting!! I can imagine you were busting at the seems keeping this quiet as long as you did. Congrats again! OHHHHH...I love this. Congrats and I will own this as well. It looks stunning! Good job! I will most definately get one for me! Congratulations - how completely exciting and what a killer shade/name too! Swatches look incredible. Congrats girl, that's so awesome! And you created a gorgeous color ♥. I've swatched it and it's incredible. I love it!! I love this color! It is in fact amazing and unique among any green polishes I've seen. Congratulations on getting to create your own polish! That is such an honor and a dream come true! Holy Jeez, I love it!! Congratulations! Can't wait to pick this one up. Wow - that's incredible! Congratulations on such a fantastic achievement!! I love the colour, it looks fantastic! 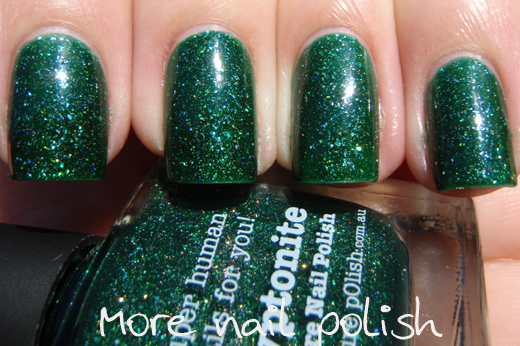 I must have this polish! I adore green. Way to create the perfect colour! Wow what an awesome opportunity! I would love to be able to do this. And what you made is freakin amazing and gorgeous and I must have some! Have bought and love this color! Thanks for collaborating to make such a wonderful polish. 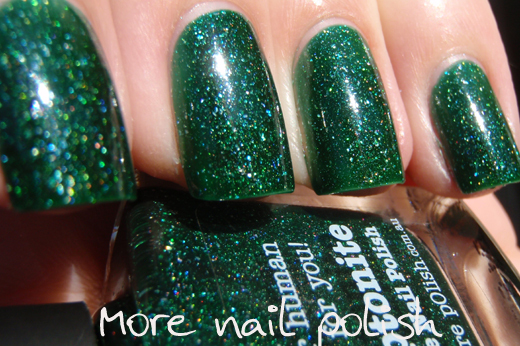 Just wanted to share with you that Kryptonite is one of the first picture polish shades I ever bought and I LOVE IT ! It's all in Russian and I don't understand a word ( you could probably google translate it) but her pics are soooo gorgeous, I thought you might want to see them in case you hadn't yet. Thank you adikile - I had not see that blog post and her photos are gorgeous! I'm so glad you love it too!